Like a lot of animation filmmakers, Rich Moore started out in television, cutting his chops writing and working as a character modeler for Ralph Bakshi’s 1980s Mighty Mouse revamp before moving on to shows like The Simpsons, The Critic, and Futurama. Now he’s making his big splash into feature filmmaking at Disney with the joyfully fantastic Wreck-It Ralph. Read Tim Kelly and I’s warm hug of a review. 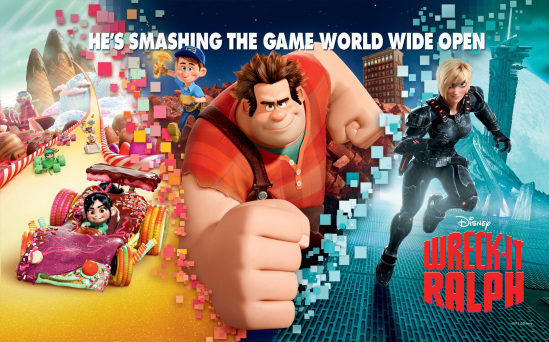 Wreck-It Ralph opens in theaters today! Josh Miller: Were you involved with the project since inception? Or had Disney already been working on a script? Rich Moore: I came in to Disney in 2008. And the concept of a video game movie had been kind of kicking around the studio for about fifteen years. When I came in it had been shelved for the second time as something called Joe Jump. I think the first time around it had been called Game On — this was in the 90s. Then Joe Jump was in the 2000s, and it was decided it wasn’t working, it wasn’t a story worth telling. So they made the tough decision to put it on the shelf. Then when I came in to develop some ideas, John Lasseter said to me, “Look, in addition to your own ideas that you’re going to develop, I would really like you to consider an idea about video games.” John and I have a love for and regard for games, especially old games. And he just thought it was a territory that would make a really good movie. And I said, “If I can start from scratch, and not have to go back to Game On or Joe Jump, yeah, I’d be happy to.” So it started like that, and I began developing it as one of my ideas to pitch to John. When that pitch finally came about, it was the one that stood head and shoulders above the others. Josh: I heard a rumor that the film was originally about Fix-It Felix Jr.
Moore: Yes! It started as a story about the hero character. It was around that time that [writer] Phil Johnston (Cedar Rapids) came on board, and we were working on it, and the story was really what it still is now — a character in a game starting to wonder if there wasn’t more to life [than the role he was programmed to play]. But it just wasn’t working, because being the hero character, it seemed like he had a really good life. You didn’t like him because he felt kind of entitled. Phil and I were at a crossroads with it. Phil then put it really well. He said, “Well, it seems like we’re trying to give Mario our story. And it is unappealing to see Mario act this way. But if Donkey Kong was thinking this way, it would be a great story!” So we realized it should be about the boss character, the bad guy character. It felt very appropriate that he’d be feeling under-appreciated, that he was tired of doing bad things, that he was starting to believe himself to be “the job.” That’s when we got some real traction with the story. But it was about two months of grinding away at trying to create a story about the character of Felix. But as is often the way [when writing], the hero of the story eventually showed himself. And we were smart enough to be open to it. Moore: The “secret life of…”. Josh: Yeah. 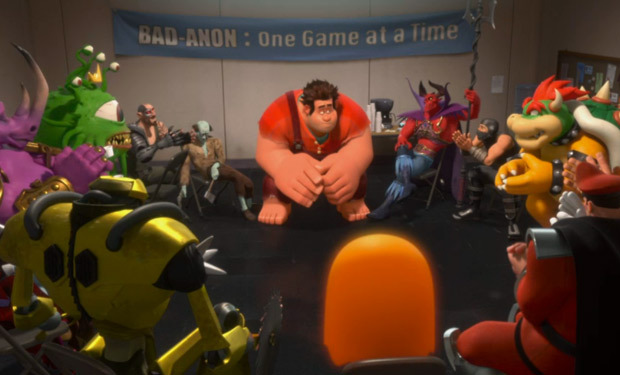 But the film I was most reminded of was Who Framed Roger Rabbit?, as far as that immediate appeal of seeing the real video game characters interacting with each other “off the job.” I’m curious what kind of deal you had to make with Nintendo. Did they have special rules? Like, you can use a Magic Mushroom and you can use Bowser, but you can’t use Mario? Moore: It was more a rule of: if things felt appropriate for scenes, then they were open to it. If we’re doing a bad guy 12 Step group, they were actually like, “You’re damn right Bowser is going to be there! He’s the #1 bad guy!” That was a given. He will be there! With Mario [who doesn’t appear in the film], we never found something that was as appropriate as Bowser being at a Bad Guys Anonymous — where it didn’t feel like a cheap walk on. And I appreciate that. It was about finding an organic place for Mario, and, frankly, nothing came up. So I eventually had to say, look, it would be great to have Mario, but there just isn’t a place [in the film] that is screaming for some Mario. And now – knock wood – if we get to do a sequel, we still have Mario in our back pocket to use him. I’m really glad in hindsight that we didn’t waste him. Josh: There are few movies I’ve seen in recent years that I’m more chomping at the bit for a sequel. I seriously want like five of them. Right now. Moore: Give them to you all at once! Josh: I’ll take it, man. Moore: And we get candy references! Josh: Exactly. Possibly even more candy jokes than there were video game jokes. It really was two birds with one stone for you guys on this project. Josh: Was there an earlier version of the script where things didn’t settle into Sugar Rush? Where there was more game hopping in the story? Moore: I remember when video games started. I remember Pong being in places, and thinking it was a TV. “What IS this?! It’s moving! I’m making it move!” I feel really lucky that I got to be there at the beginning, and seeing first hand things go from Pong to, like, Halo. Just the progression and evolution. I love playing games. I guess I’m a gamer. Some people say, “You’re not a gamer unless you play such-and-such.” Fragging! So, I’m like, well okay — I just play games then. For me it was all very familiar territory to jump into. I was able to say, “Oh you gotta have this, and of course he’s going to go into a shooter. It would be cool to see Mario Kart in a real world.” I was lucky to be able to bring the things that I love from the past [of gaming] into the things that I love now. To have some insight and make sure it is done right, with respect but with a sense of humor. It seems like whenever they make movies about video game worlds, I don’t know why, but they’re always so serious. They’re not really about the games. It is more like taking the situation, the milieu of the game, and trying to make a real situation out of it. They never embrace the conceit of, “No, we’re in a game. We’re living in a game.” Tron [had the right attitude]. Our characters know they’re in games and I love that. Josh: Hey, you made a whole movie about video games. If that doesn’t earn you the right to say you’re a “gamer, ” I don’t know what does. Moore: Yeah! I made Wreck-It Ralph guys! For godsake! Come on!